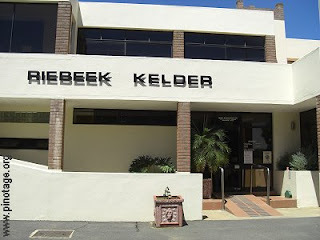 Riebeek Cellars is a large volume winery in the Swartland near Malmesbury. Founded in 1941 as a co-operative cellar it is now a private company owned by 60 farmers. Much of the wine it makes ends up under other peoples brand names, but the winery releases a extensive range of Swartland wines under its own Riebeek Cellars label. These labels carry a sailing ship logo “Jan van Riebeeck sailing to the Cape is the first thing people think of when they see our name,” says cellar master Zakkie Bester. Zakkie is proud of the Pinotage Rosé 2007. It is a pale salmon with an orange hue. It is just off-dry, (3.5gL RS) light clean and refreshing with strawberry and ice-cream flavours. (13%abv) Zakkie tells me they pick 20,000 tons of Pinotage and 35% goes to the increasingly popular Rosé. 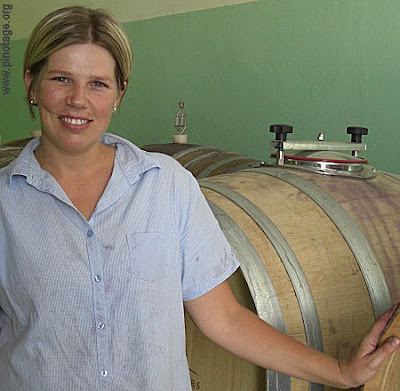 The 2005 ‘Limited Release’ (red) Pinotage was the result of a experiment in barrel fermentation by winemaker Alecia Hamman (pictured below). To my taste this bottle was kept too warm in the tasting room and this accentuated its 14.5% alcohol making it taste ‘hot’ and that overshadowed the berry and spicy flavours present. But I had tasted this wine before with Zakkie in better conditions -- see here. Zakkie calls the Riebeek Cellar Pinotage 2005 his ‘house blend’ in that it represents what Riebeek Cellars does best, which is making quality wine in large volumes. I found it restrained, rather Rhone like, with good fruit flavours and balance. It costs just R25 and is jolly good value. The grapes come from dry-land bush vineyards and 20% sees a little oak in the form of staves and chips. We found winemaker Alecia Hamman by her experimental barrels tucked away among the massive stainless steel tanks that soar far overhead in row after row. Notice these new French oak barrels have a large hatch on top wide enough to take the berries directly after they’ve been crushed. They’ll be fermented on the skins in the barrel. Alecia tells me she loves working with Pinotage.